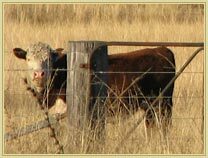 George Wyndham brought the first pure bred Herefords to the colony of New South Wales in 1827. The Hereford has since become the most important breed of beef cattle in Australia. The Dalwood herd was renamed Leconfield by George's son Reginald in 1870. Reginald Wyndham was a prime mover in the formation of the Hereford Herd Book Society and was the first Australian elected a Life Member of the English Hereford Society. George Wyndham's grand-daughter, Charlotte May Wright, purchased half of the herd in 1884. The descendants of these cattle continue in herds still owned by the family.